The more and more I think about the concept of this movie, the more terrified I become. 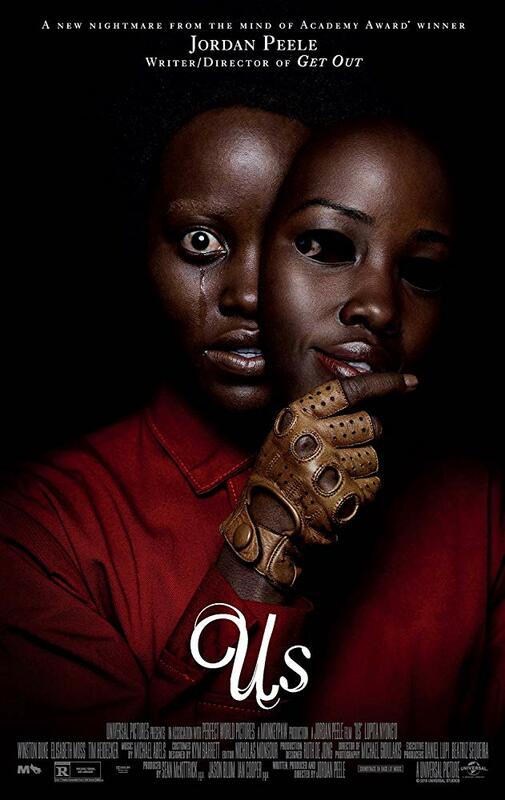 Starring Lupita Nyong’o, Winston Duke, Shahadi Wright Joseph, Evan Alex, Elisabeth Moss, and Tim Heidecker, Us is the second feature film from writer/director Jordan Peele, who brought us the excellent Get Out in 2017. The film follows a family, whose beach vacation becomes a living nightmare when they are terrorised by four strangers who seem to be their doppelgängers. To say I was a little excited for the release of Jordan Peele’s next horror experience would be an understatement. Us was one of my most anticipated movies of 2019 (I think it was sixth on my list) and I was counting down the days to its release. Then I went and watched it with a few friends who were also very keen, and I can safely say that it was definitely worth the wait! Us is a modern horror classic that will dig under your skin and make you feel uneasy long after watching it. I was expecting big things, and the fact that this still surprised me at every turn has made me fall in love with it. Even though this may sound like my usual conclusion, don’t worry as I’m about to get into my standard structure, it’s just that I am in love with Us right now! First of all, Jordan Peele has written and directed one of the most unique and original horror movies I’ve ever seen. The concept alone is enough to make someone curious. I know a couple of people who don’t even like horror movies, but they want to watch this just from hearing the concept itself. Peele’s writing elevates this concept into an expertly crafted thriller esque horror film with some well-crafted comedy elements. Similar to Get Out, there are some hilarious moments thrown in, and they mostly hit the mark. Peele has somehow already mastered the ability to make you terrified in one scene, and then laugh minutes after. So many filmmakers have tried and failed at this, but Peele has already found the sweet spot, and this is only his second film. This brings me to the performances, which are all incredible across the board. Firstly, I have to talk about the elephant in the room, which of course is Lupita Nyong’o. If you don’t already know Nyong’o, her performance here will make you want to keep your attention on her future work. She gives what is arguably her best performance yet as two very different characters. Her main performance as Adelaide Wilson is fantastic on its own. She nails this character who is haunted by a traumatic experience she had when she was younger in this same location. The way Nyong’o plays around with this character is fantastic, but it’s her performance as Red that results in what is easily a very tough performance to beat for the rest of the year. Nyong’o is terrifying as this doppelgänger who seems to have a personal vendetta against Adelaide. Everything from the way she moves, to her horrifying voice, make her one of the best horror villains in recent memory. Winston Duke is also fantastic as Gabe Wilson. Duke’s character is basically the comedic relief in Us, and he does a great job as this dad who is trying to get his family through the night while making sure they don’t go insane. He creates a memorable and loveable character, and the movie would be very different without him. Shahadi Wright Joseph and Evan Alex are also fantastic as the two children in the family. Shahadi Wright Joseph did a fantastic job as Zora Wilson, who seems to be written as a young Ripley wannabe, judging by the way her character wants to fight back against their doppelgängers. Evan Alex is also just as good as Jason Wilson, who has a few great moments throughout the movie. But their performances as their doppelgängers are even better! Both are terrifying, and I’m looking forward to their future performances. Everyone else from Elisabeth Moss to Tim Heidecker gives memorable performances, which results in a well-acted horror movie! The next positive I want to talk about is the score, which is just brilliant! Composer Michael Abels does a fantastic job at crafting a memorable and haunting score that sent chills down my spine multiple times throughout. One aspect I love about his score is that he keeps bringing back the song ‘I Got 5 On It’ in different ways. You first hear the actual song pretty early in the film, and then it comes back in the form of this intense Cello and Violin piece, which is my favourite track in the score. Then there is Anthem, which is already iconic and the film hasn’t been out for long. Easily one of the best horror scores of the decade. If I had one negative, it would be that one scene (without spoiling it) towards the end feels anti-climactic. It was a beautiful and tense scene, and then it just ended, and I was kind of disappointed by it. It also could be about 5 minutes shorter, just to keep the audience more invested and intrigued throughout. Other than those little nitpicks, Us is brilliant, and it needs to be seen by as many people as possible! Overall, Us is a brilliant horror/thriller that taps into the idea of doppelgängers and makes it terrifying. From the fantastic performances, smart writing and excellent score, Us is a modern horror classic that encourages repeat viewings, and I can safely say that I am very keen to revisit it as soon as I can! If you thought Jordan Peele was a one-hit wonder with Get Out, Us is proof that he is here to stay.